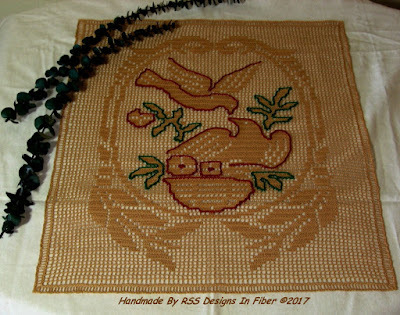 Hearts - in my Designs In Fiber!! 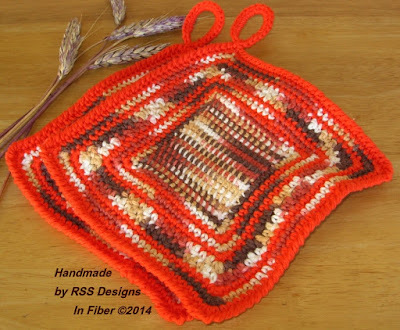 This is about communication - about life - about creating and things created - and sharing information! I Agree - No Pebble Mine in Alaska! See A Video!! 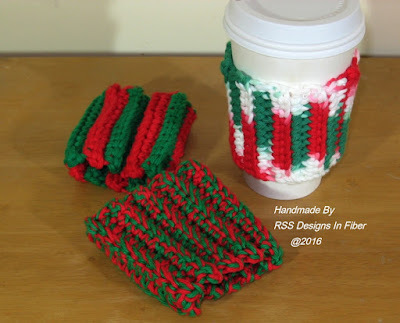 Vow to REUSE - Not Recycle!! I have been reading about the proposed "Pebble Mine" in Alaska for years now. 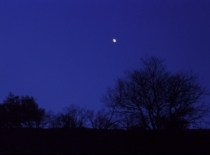 Right away I was against it, but then I heard about it from Conservation Photographer, Robert Glenn Ketchum -- and have seen a number of his stunning photographs of the area in which they are proposing to put such a Mine. 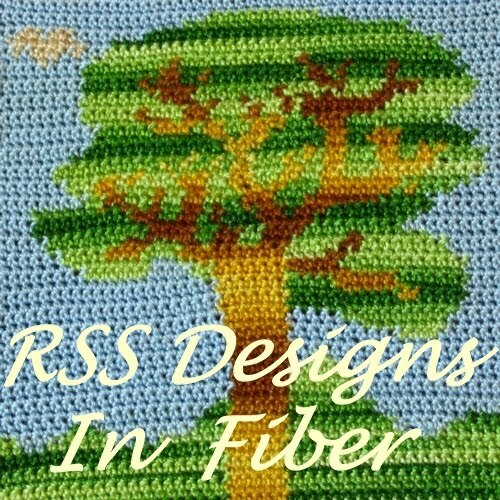 Here is a Video from the NRDC - National Resource Defense Council - an effective environmental group I really got familiar with during the Sierra Nevada Forest Protection Campaign (now Sierra Forest Legacy ) back in the late 1990's - early 2000's in California - as they were a major legal force in that campaign - including the Giant Sequoia National Monument Public Process, which I blogged about years ago . But This is a Video about another major issue the NRDC is a major legal force on - the proposed "Pebble Mine" - and this Video deals with a major problem with the proposed "Pebble Mine" in Alaska - major Earthquake Problems, as the area in which they propose to put the mine has high seismic activity, which I read about somewhere years ago. I, personally, totally agree with the NRDC and Robert Glenn Ketchum on stopping the "Pebble Mine" totally - as I think it would be total folly to create such a mine - for a whole lot of reasons at this point - and reading what the NRDC and Robert Glenn Ketchum have to say about it the best thing you can do (I am not going to try to re-say what they have said much better than I ever could). But right now, I recommend you watch this video for some accurate information about this major problem with the proposed "Pebble Mine" - get a good idea why it should not be done from this video - and If you feel like doing some Activism - there is a link at the end of the description of the video to a page at NRDC for sending a comment letter. -- I already sent a comment letter there myself. I think the already existing, high successful Alaskan Salmon Fishery, which is where the "Pebble Mine" is proposed, is much more important than the proposed damaging open pit mine for more Gold and Copper, which I think we can live without. With my Love of Animals - Both Wildlife and Pets - if you have read anything I have written about that online, you will understand how much I LOVE this Live Cam of a Wild Bald Eagle Nest in Big Bear, California!!! I have watched it several times since discovering it - with the Eagles doing different things. 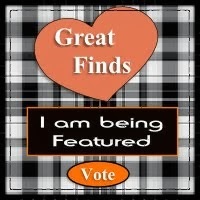 You can check it at any time! I live in the Antelope Valley - southwest of Big Bear and on the southern side / slopes of the San Gabriel Mountains - and a few times, when walking in the fields in Pearblossom - I was sure that I saw either an Eagle or Falcon or other such large bird way up in the sky - I figured that those large birds probably lived in caverns or trees in the Mountains. But this is the first confirmation I got of Eagles living in and nesting in the Mountains of Southern California - Big Bear, California, where this Eagle Nest is - is in the San Bernadino Mountains - east of the San Gabriel Mountains, where I live. 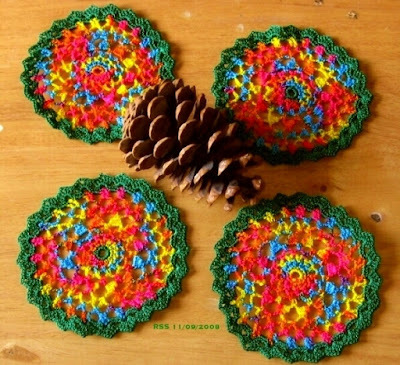 I spent a week one December winter years and years ago in Big Bear - nice any time of year with a very nice drive up to there - but in mid-winter, like December, it is often covered in snow -- it was that week I was there. Apparently, if it is snowing, you can sometimes see it snowing on this Eagles Nest - since it is Live. 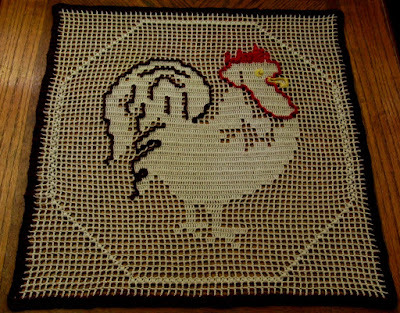 I tend to reflect the things I love in Life in my Arts and Crafts - here is a White Eagle I crocheted years ago in Filet Crochet (it sold, too)! 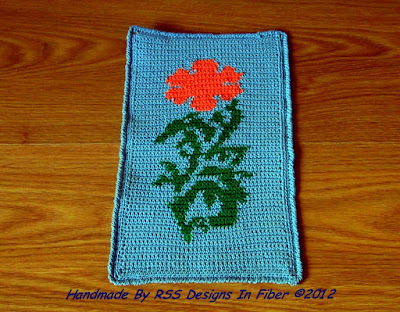 Do you like Bold and Bright??? 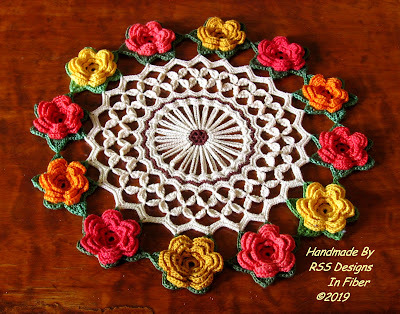 ~~~ Here is my newest RSS Designs In Fiber Handmade Irish Crochet Doily with 3-dimensional, multi-layer Crochet Roses in Coral Reds and Bold Yellows - Great for Bright and Bold Decor! 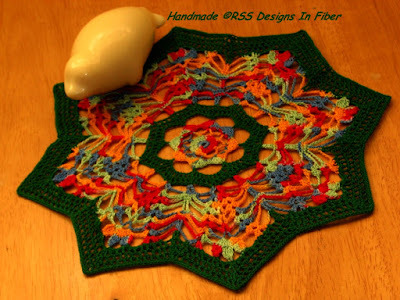 A Round Doily with 12 multi-layer Crochet Roses - each one having 5 layers of 6 petals with the bottom layer being Green (to look like leaves on a Rose Flower) -- Handmade Crochet By Ruth Sandra Sperling of RSS Designs In Fiber. 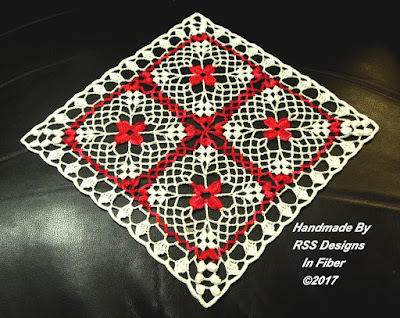 Brighten up any Table - or Dresser - or Shelf with this Coral Red and Yellow Floral Design Decor Accent -- 11 1/2 Inches Wide! 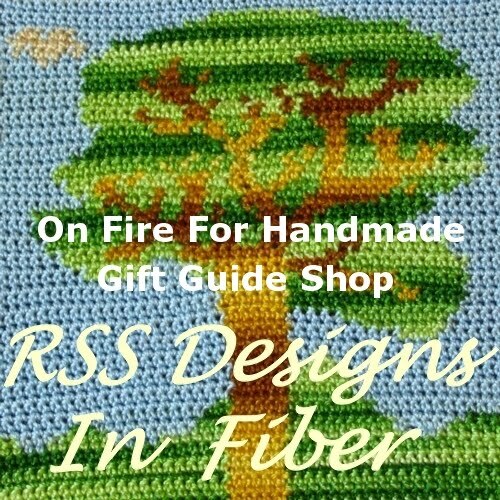 Bright and Bold seem to be popular this year, so I am going to share several more colorful Handmade Fiber Designs items from my "RSS Designs In Fiber Etsy Shop" - with Bright and Bold coloring!! 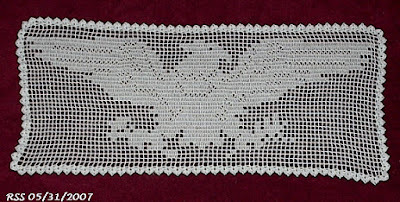 - with a White Lace Cluster Doily Border. 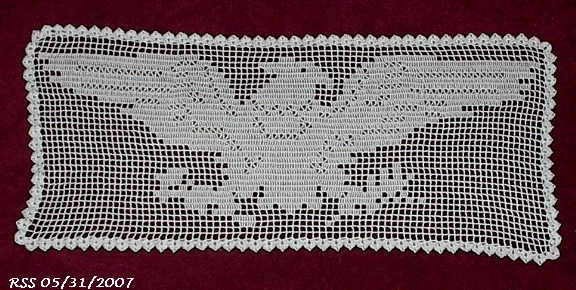 The Doily is a 9 1/2 Inch Square. 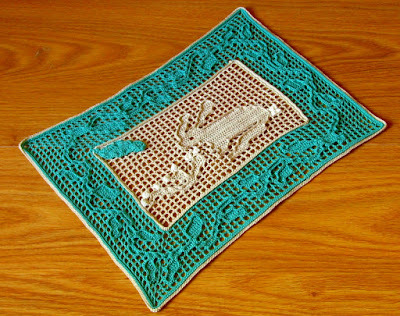 If you display it as a Diamond Shape - it is 13 1/2 Inches high and wide - Corner-to-Corner. 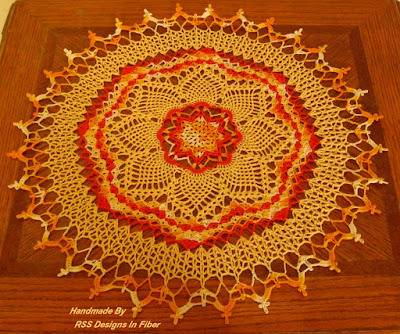 Bright Fiesta Red is an exciting Red that cheers up a space when used in Decor Accents such as this Doily!!! 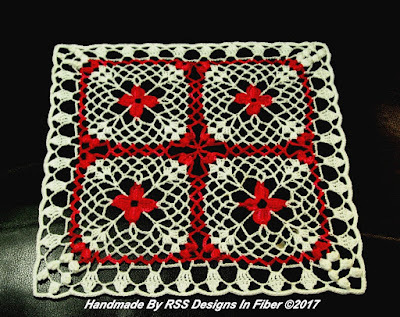 On Fire For Handmade has done a Handmade Finds: "Painting the Town Red" - including my Doily above in it - click on the heart in the upper Red corner there to vote for it! 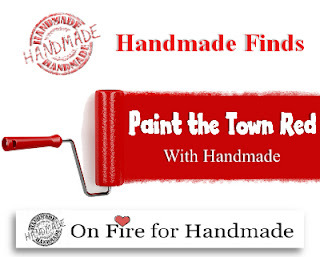 Take a look at the Collection of Handmade in "Painting The Town Red" for a variety of Handmade goods! 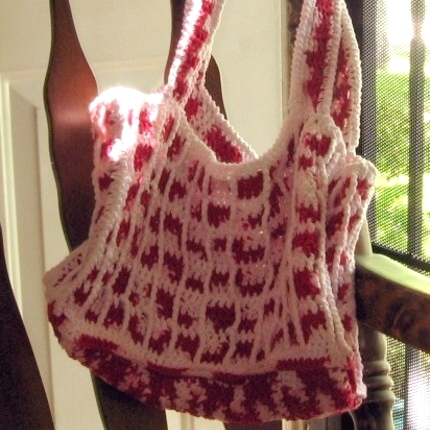 I use various shades of Red crochet threads and yarns to make Handmade products. 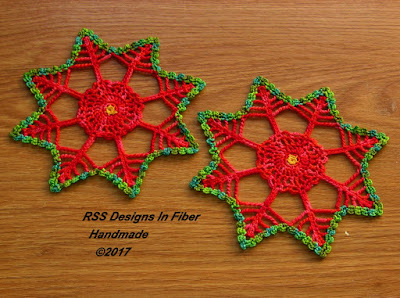 Here are a few more of them with cheerful Bright Red in them - click on photos to find them online! 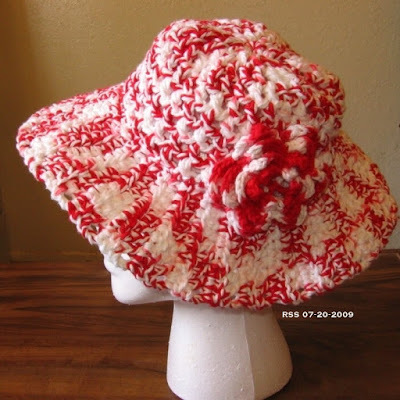 My RSS Designs In Fiber Handmade Hats and Bags and Accessories with Bright Red! 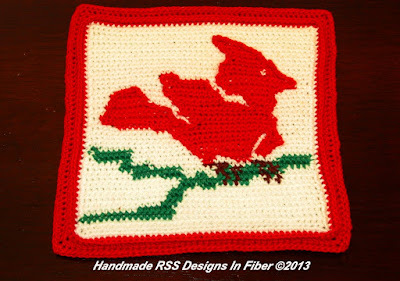 Handmade RSS Designs In Fiber Decor Accents with Bright Red! 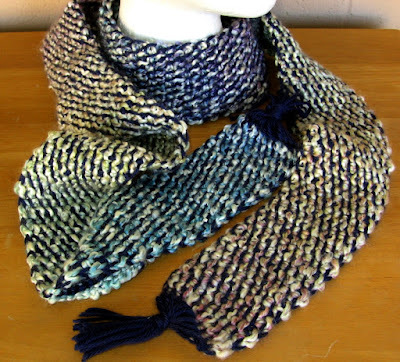 ~~ and there is a Matching 86 Inch Long Scarf made with the same yarns and the same Afghan Crochet Tweed design! 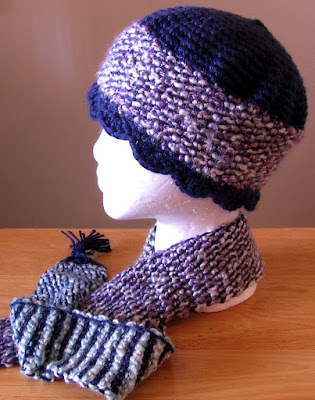 ~~ Also Chunky, Warm and Soft! 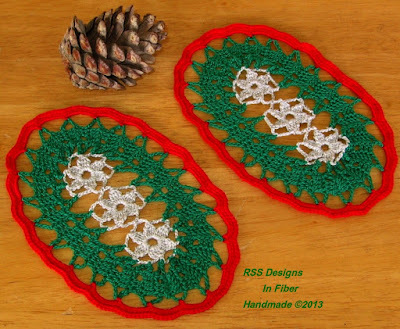 For the Winter Season - Green Holly Leaves with Red Berries is a rather popular decorating item - so I decided to make this so it would be large enough to be a Table Topper (or Wall Hanging)! 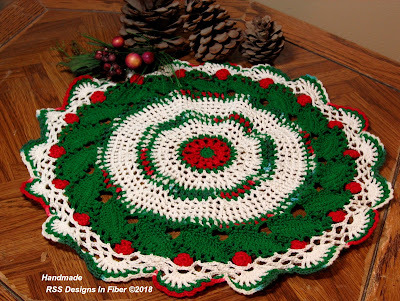 It is 17 Inches in Diameter - and would be nice on bare furniture, on a tablecloth or hung up. 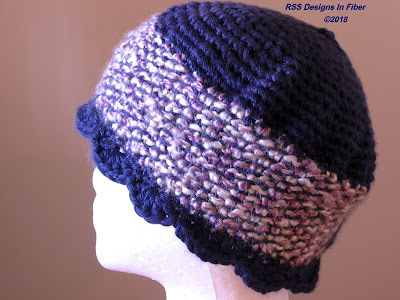 My Etsy Shop - Handmade Accessories I Make! 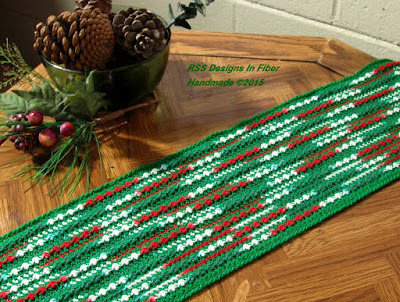 To Contact Me PRIVATELY - OR FOR PRIVATE CUSTOM ORDERS - CLICK HERE! 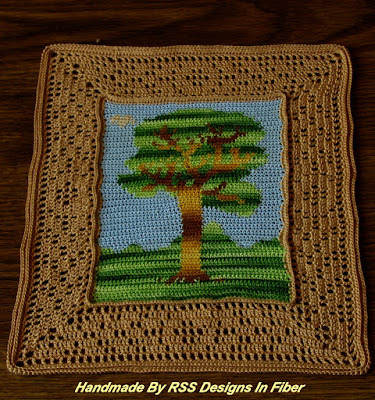 TREE TAPESTRY in Fine Thread Colorwork! 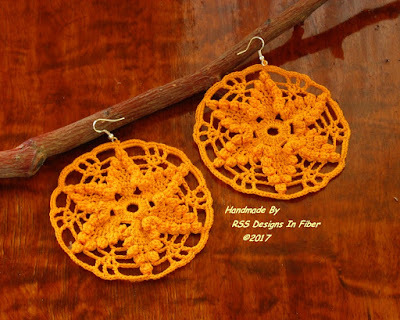 My FLOWER DESIGNS in THREADS - Doilies & More! 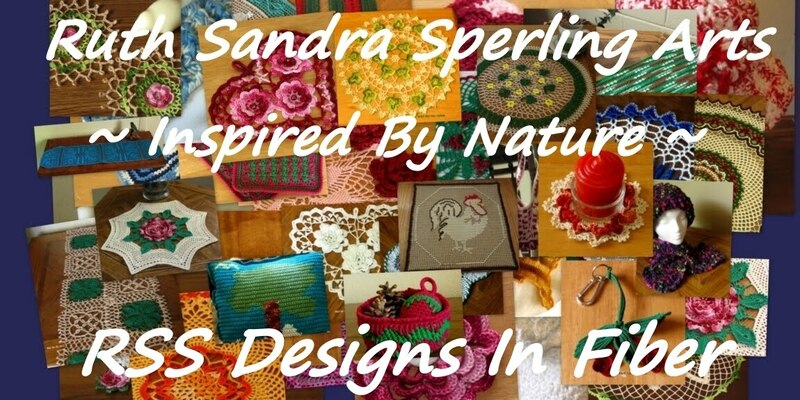 My Designs on You Tube!! 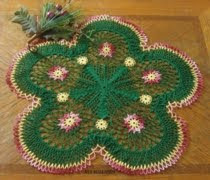 Garnet Flowers in Evergreen - from You Tube Video! 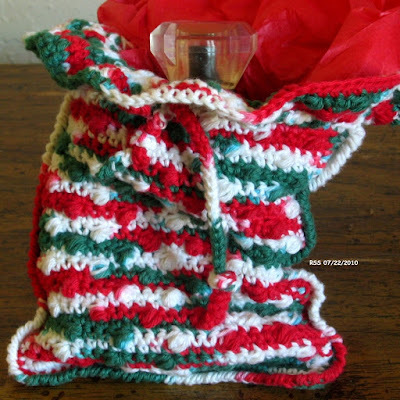 ARTISAN FEATURE: Pete Berkow of "Songbird & Scallywag"